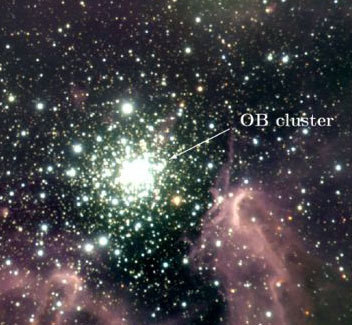 OB cluster in the galactic starburst region NGC 3603. Image: ESO. OB stars are O stars or B stars. These have similar properties and frequently occur together in space in OB associations. 15 × 15 arcminute field at the center of the Cygnus OB2 association. Image: Palomar Sky Survey. An OB association is a loose grouping of between about 10 and several hundred O stars and B stars, scattered across a region up to several hundred light-years across. The members of an OB association are all of roughly the same age (or in subgroups of the same age) and formed from the same interstellar cloud within the past few million years. See also T association.